Because it doesn’t enshrine the best-remembered games from the ’90s, the PlayStation Classic isn’t quite everything we hoped it’d be. But what it lacks in software is made up, in part, by its lovingly crafted hardware. Sony could’ve followed in Nintendo’s footsteps by releasing a populist's retro console, one that had the undisputed best games of the era like Crash Bandicoot, Final Fantasy 8 and 9 or Tomb Raider. But that's not the PlayStation Classic. It doesn’t include the majority of the console’s greatest hits and instead opts for some cult classics like Persona and Jumping Flash among a few well-received titles. Using Sony’s retro console is therefore a lot less like walking down memory lane, an experience we had with the SNES Classic and NES Classic Mini, and a lot more like a sample platter of what the PlayStation had to offer 20-some-odd years ago. Ultimately while there’s fun to be had with the PlayStation Classic’s collection of games, the gaps in what could have been a dream line-up are obvious. Where’s Castlevania: Symphony of the Night? Where’s Silent Hill? Chrono Cross? Tomb Raider? Where's The Legend of Dragoon or PaRappa the Rapper? I'll tell you where you won't find them: Sony's first retro console. Sure, these games are available on other platforms, but being able to play them on a recreation of the hardware they helped define would have been a true celebration of the iconic system. What's there is a collection of titles that you can enjoy in an afternoon but probably won't be coming back to anytime after that. There's no telling why Sony went down this path, but the most likely reason is that this was the first age of the CD-quality soundtrack, and so many games featured licensed music – the rights to which have long since expired, making it difficult (or costly) for Sony to re-acquire them. That's not Sony's fault, but it does make for a less-than-stellar selection of games. A more fundamental issue lies with the fact that the first PlayStation was an entry point into the world of 3D gaming at home – there were lessons to be learned, as developers got to grips with the new way of working and, as a result, the early PlayStation games (many represented here) were a bit rough around the edges. The SNES, on the other hand, has a library that works far better in a “Classic” resurrected format, as its games represent the absolute zenith of the 16-bit, 2D era. Ultimately, while there’s an afternoon of fun to be had here by revisiting the dawn of the 3D era, those expecting stone cold classics and long-lasting shelf-life will be disappointed. Power turns the console on and off, while Open allows you to switch virtual discs in multi-disc games like Final Fantasy VII. Reset is slightly different though, in that it takes you back to the game selection menu and creates a resume point for the next time you want to jump back into that game - similar to the system found on the NES/SNES Classic but with just one save slot instead of four. Anytime you exit a game by resetting the system, the Classic will ask you if you'd like to overwrite your old save point - basically inviting you to overwrite your hard work at every turn - and other than saving to the memory card there's no way to 'lock in' a save to prevent someone else from coming along and killing that checkpoint. The big difference between the original console and the Classic is that the latter doesn’t play actual discs and there's no way to add games from the PlayStation Store to the console. That shouldn’t be a big surprise or even news to you at this point, but it’s worth pointing out now to avoid the inevitable comment of “Can it play my old PlayStation games?” There's no online multiplayer, either, in case you were hoping for a way to play Cool Borders 2 with a childhood friend halfway across the world. Less impactful, another small difference can be found on the controllers themselves: While all of the buttons return from the original in their original form, you’ll find that the controller terminates in a USB port. That could potentially mean that the controllers will work on your PC if you have an emulator, but it definitely means that Sony isn’t introducing a proprietary port exclusively for the retro console. Speaking of, as you might’ve noticed already, the two controllers that Sony supplies are obviously from the pre-DualShock days. That means you’ll have to use the directional pad as your primary form of locomotion in games and forgo the arguably better control schemes for Resident Evil Director’s Cut and Tekken 3. That’s not a deal-breaker, obviously, but it might not have hurt Sony to announce a DualShock controller variant alongside the true-to-the-original package. Finally, the controllers are a bit short, and could give players some trouble if you want to kick back on the couch with a friend. A small boon, however, is that they plug directly into the front face of the console and don’t require you to remove a faceplate like you do with the SNES and NES Classic - which, ultimately, gives Sony’s console a cleaner look and serious style points. Boot the console up for the first time and you'll be asked to choose your language before getting tossed into the inoffensive interface. There's not a lot of toying around to do here and strictly serves as a gateway to the games and a way to manage to memory card saves. What we mean there is that not only will these games play exactly as you remember them in terms of control schemes, but they also haven’t been given an HD update - you’ll get the gritty, grainy FMVs you know and love on TVs that weren’t even conceivable when these games came out 20-plus years ago. On the other hand, it can also be absolutely eye-searing to look at these games on a 1080p or, god forbid, a 4K TV. The console doesn't even attempt to upscale the games and the years haven't been kind to sub-HD graphics. That double-edged devotion to nostalgia can be found throughout the PlayStation Classic's game library. Sure, these games are exactly as you remember them, but even back then using R1/R2 as a stand-in for a right analog stick (in the case of Rainbow Six) wasn’t much fun. What’s more frustrating is that several of the included games have a modern remastering but, because Sony stuck the original ROMs on here, you’re forced to suffer through the clunkiness for nostalgia’s sake. The PlayStation Classic comes preloaded with 20 games of varying quality pre-installed. All built-in, including multi-disc titles, it’s a pocket library of early 3D games. Note that it’s a fixed list – you won’t be able to add any more titles to this console, as there’s no storage expansion or internet connectivity. Here’s a quick overview of the games you’re getting. A solid brawler that’s focussed on weapon based combat, it’s quite a tactical, slow fighter. Not a bad game by any means, but not exactly vintage PlayStation, either. Great for its day, but the downhill slalom action feels pretty basic these days. Snowboarding was a hip new sport in the mid-nineties, but the novelty is no longer enough to see this worth a long stretch of play. Damage modelling on in-game cars was a revelation when Destruction Derby first came out, and bashing vehicles to smithereens remains fun – Grand Theft Auto has made a killing out of it. But the handling here, lack of split-screen and dearth of modes makes Destruction Derby wear thin quickly. It’s a pity its far-superior successor isn’t present instead. One of the all-time great JRPGs, following a rag-tag team of freedom fighters across an epic quest to save a futuristic fantasy world. It’s available on essentially every platform these days, but it’s still a great and on that deserves to be experienced by all RPG fans. The one that started it all for the Grand Theft Auto series, and it’ll be quite a surprise for those that have only played the 3D entries. It’s primitive by today’s standards – a top-down crime sandbox. It’s still a good laugh, darting around the streets causing havoc, but it was never much of a looker, and looks particularly bad blown up onto a large modern screen. Otherwise known as ‘Kurushi’ in Europe, Intelligent Qube is a bit like an Escher-drawn nightmare, with tumbling blocks chasing a fleeing protagonist around dark and eerie mazes. Light the right tiles with your footsteps and have the block fall onto them to eliminate them. A good brain teaser. A bizarre game that sold the potential scale of 3D gaming well at the time, Jumping Flash is ostensibly a platformer, except it’s played from a first person perspective. It’s polygonal verticality is still vertigo-inducing, but it feels more like an experimental demo these days rather than a full game. The bedrock of modern gaming, Metal Gear Solid remains a fantastic espionage thriller. It holds up incredibly well, with a cinematic flair that many games still fail to achieve in this day and age. The best game on the PlayStation Classic. A charming puzzler that sees you digging underground while keeping your air supply from running out and blocks from falling on top of you. It’s 2D visuals and colorful action means it holds up relatively well on the PlayStation Classic. Abe’s Oddysee was weird when it was originally released in 1997, and it’s still very, very weird. A joke-filled sci-fi puzzle game, you’ll play an alien slave, on the run from his meat-packing captors. Tough, but an enjoyable 2D curio. Lovingly animated and quirkily put together, Rayman is still good fun to play. Taking advantage of power unheard of before the PlayStation’s release, it pushed 2D gaming to the limits of its day. Still a good play. Before every game in the world had a zombie mode, Resident Evil was the first to have them clambering from their graves in a believable way. Its controls date it more than it deserves, but this campy homage to George A. Romero’s undead apocalypse paved the way for the modern obsessions with rotting humans. Bettered by Resident Evil 2, but still worth spending time with. The Persona series is really only now getting somewhere near the mainstream recognition it deserves, so this opportunity to take a look at the original is a welcome one. A curious JRPG about Tokyo kids fighting demons, it’s well worth a look, if not the series at its eventual best. Arguably the best racer on the PlayStation (especially if you’re into arcade thrills rather than Gran Turismo’s focus on authenticity), Ridge Racer Type 4 gets the best out of the hardware, with thrilling circuits, a good career mode, and some great rade tunes. Mix Street Fighter with Tetris and you’ll get something a little bit like Super Puzzle Fighter II Turbo, which sees you chaining colored gems together for big point scores. A staple of arcades (and basic all consoles up until the PS3), it’s lots of fun, with a cutesy take on the Street Fighter cast adding to the charm. It wasn’t as good as Metal Gear Solid when it came out, and it’s no better now. Syphon Filter is more action-orientated than it’s similarly-spy-themed Konami rival. But its use of an over-the-shoulder third person camera at a time when camera control hadn't been mastered can make its frenetic action a bit difficult to stomach. Still, it’s inventory of inventive gadgetry is still fun to play with. The best fighter on the PlayStation by a country mile, this is exactly the sort of game the PlayStation Classic should be celebrating. A good roster of fighters, a captivating fight style and plenty of options, you’ll really be able to sink your teeth into this. An early attempt at a (single player) team based first person shooter, Rainbow Six was important in bringing tactical action to the FPS genre. However, it’s slow and somewhat obtuse by today’s standards, making it hard to return to. A third racing title for the PlayStation Classic. Well regarded in its day, Twisted Metal set itself apart with its Mad Max-like vehicular combat. Still fun in short bursts, but not a classic. An unusual RPG, Wild Arms fuses sci-fi fantasy with an eco-conscious message, wrapped up in a wild-west aesthetic. Red Dead Redemption this is not, however – expect turn based battles and anime histrionics. Of course, not every game is in 3D and not every game on the console has clunky controls. Super Puzzle Fighter II Turbo looks absolutely fine and plays great. The same could be said for Rayman (mostly) and Mr Driller, which might be better received now than it was 20 years ago. These games, due to some key design decisions, look and play just fine on the PlayStation Classic. The other upbeat comment we’d make is that despite not playing some of these games growing up, we found ourselves engrossed with some of the more niche titles on the PlayStation Classic. The two that come to mind are Revelations: Persona, the first entry in the now ultra-popular Persona series, and the more popular, but still not quite widely renowned Wild Arms. Buying a PlayStation Classic would give older gamers like us who missed these the first time around a second chance at experiencing the console’s sleeper hits, and younger gamers a shot at games like ubiquitous '90s classics like Final Fantasy VII, Metal Gear Solid and Tekken 3. That said, if you're only here for the classics, they look and play exactly as you'd expect and for most, they're the crown jewels of the collection. Considering that these games alone often cost $10 apiece on the PSN Store, you're actually getting a small bargain by Sony including them with everything else. As a whole, however, it's as we feared when we initially previewed the console back in October: the PlayStation Classic just doesn't have the games to keep you occupied for more than a few hours at a time. Unless you're seriously committed to playing through cult classics from start to finish, you'll likely play your favorites and put this console back in the closet - possibly next to the original PlayStation you had hoped it would replace. While it’s easiest to compare the PlayStation Classic to Nintendo’s retro console revivals, the SNES Classic and NES Classic Mini, Sony’s Classic micro-console adds a new dimension to the mix. Literally. As most of the games on the PlayStation Classic are in 3D, it faces upscaling issues and problematic control schemes that simply weren’t a problem on Nintendo’s sprite-based consoles. But rough-around-the-edges graphics aren't the console's only issue: while it has a very small handful of the system's best games - Metal Gear Solid, Tekken 3 and Final Fantasy VII included - there are just as many or more games that just might not live up to expectations, either because they’re cult classics rather than mainstream hits, or because the gameplay just doesn’t hold up in 2018. 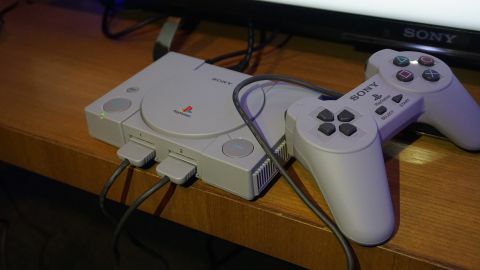 Some folks might develop a real attachment to games like Destruction Derby, Ridge Racer Type 4 and Intelligent Qube - and if that's you, then the PlayStation Classic is going to be everything you've ever wanted in a retro console. If not, however, then you'll be disappointed with the game selection, unimpressed by the lackluster interface and forced to watch, often in horror, as late '90s FMVs are brought to life like Frankenstein's Monster on your 4K or 1080p TV. How did Sony get the PlayStation Classic so very wrong? Editor's Note: Gerald Lynch contributed to this review.